•How Expedient’s cloud solutions leverage Intel technology to deliver high availability and performance at compelling price points. •Comprehend how Expedient has built-in security components and is allowing easy auditing of their cloud services. 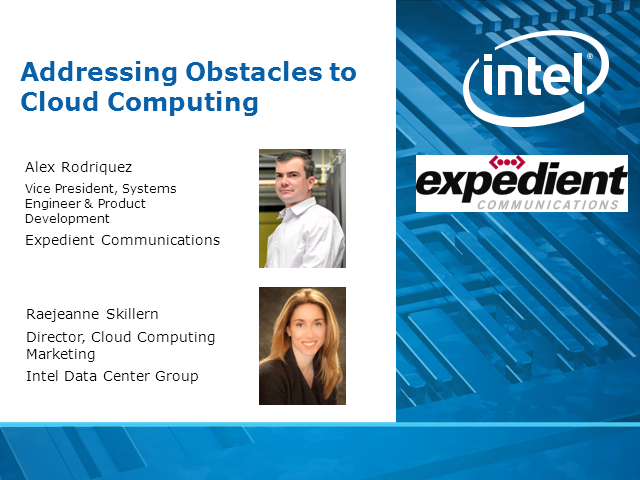 •Understand how Expedient is working with Intel to take advantage of recent advances in hardware and software to build a foundation for trust, security, and compliance in their cloud solutions. One of the biggest concerns for enterprises considering public cloud services is the notion that they are inherently unsecure. Many cloud implementations treat security as an afterthought - layering it on top of the virtualization server. A more secure solution is a "multi-layer approach", a series of security layers that begin at the base of the network and protect an organization’s assets to the service layer. In this session, John Rowell, CTO of OpSource, joins Intel to discuss the best practices for securing the cloud, comparing and contrasting various approaches for providing edge-to-edge security. Intel has been working with global IT and ecosystem leaders to identify next-generation data center and end-user needs that ease the adoption to cloud computing. Attend these webcasts to learn about new capabilities like hardware-assisted virtualization, unified networking, policy-based power management, and trusted compute pools that help with your journey to cloud computing, and also hear from cloud computing service providers who are utilizing these Intel technologies to increase the security, performance and availability of their cloud computing solutions.